After 10 days in Tobago we flew back to Trinidad on what they call Old Year's Day and moved into an apartment in uptown Port of Spain. 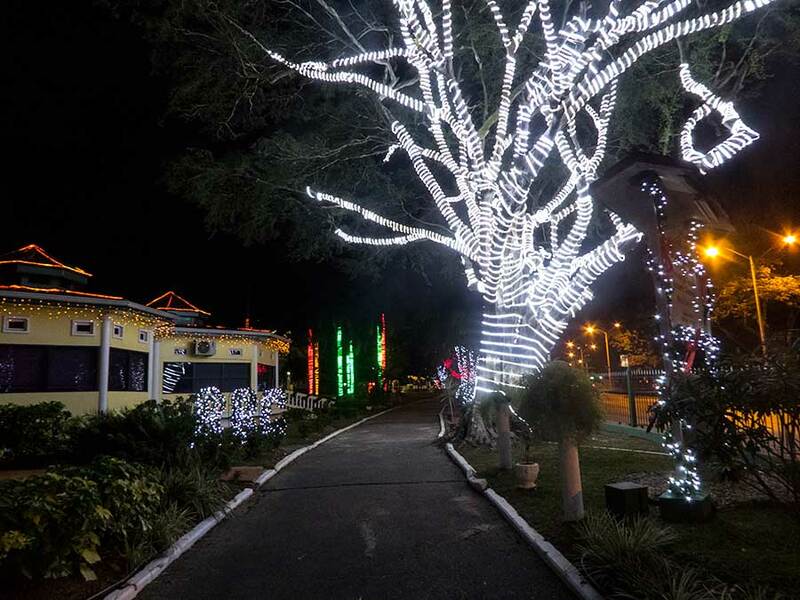 By now we are better tuned in to the Trinbagonian accent and picking up some of the local names as well as enjoying the popular food on sale at road and beachside stalls, including intriguingly named "Buss Up Shut", "Doubles" and "Bake and Shark". The food here is often colourfully named and full of surprises. Downtown Port of Spain has a number of historical buildings but unless you are shopping it's quite seedy so we only paid a short visit. 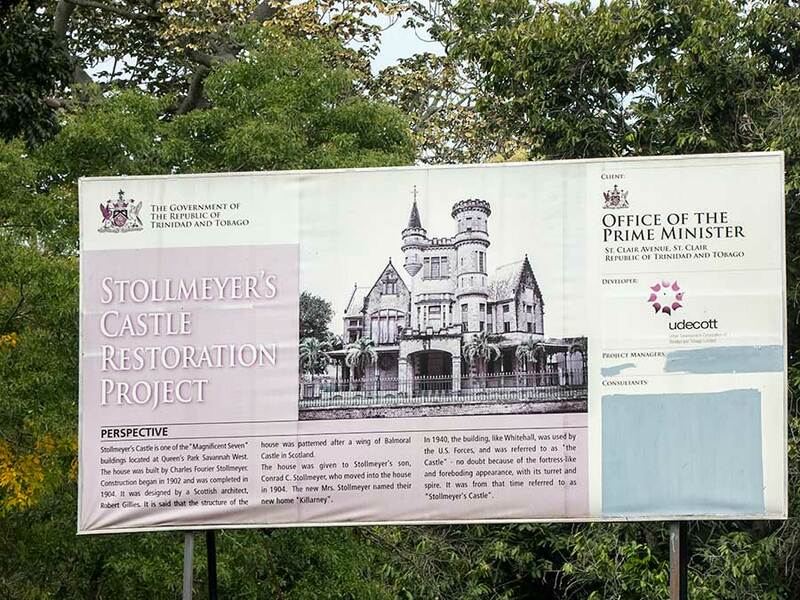 Uptown Port of Spain is different, with the large green space of Queen's Park Savannah, extensive botanical gardens and imposing buidings, including the National Museum which is well worth visiting for its fascinating exhibits and artwork. We learned a lot about the history and culture of the island by spending a few hours there. 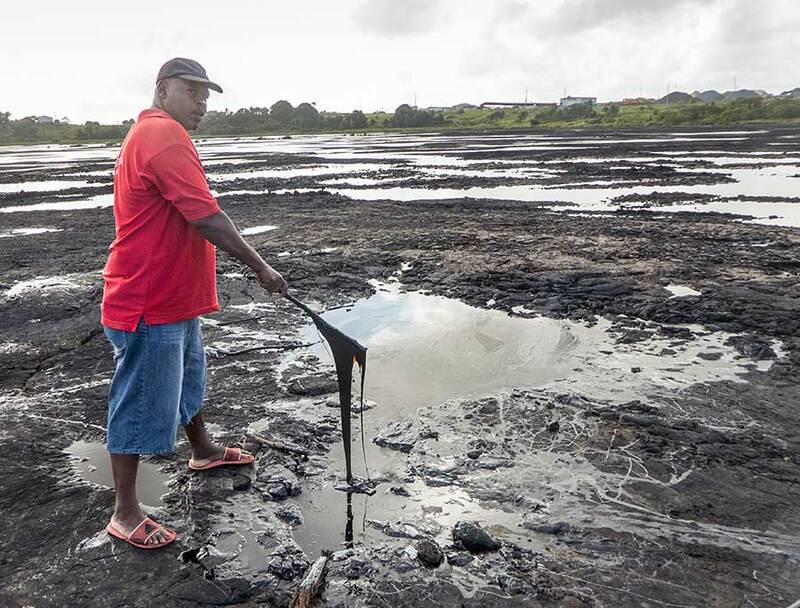 Trinidad is a relatively large (for the Caribbean) island, dependent on it's oil industry rather than tourism. We wanted to see as much as possible of the country so hired a decent car (£21 per day instead of £16 for an old banger). We'd already had some practice driving on the roads and in Tobago we'd experienced the lack of signage in remote areas though, thankfully, locals are generally helpful when giving directions. The main roads to and from Port of Spain are quite hectic - drivers under as well as overtake and certainly don't worry about the 80 kph speed limit. Elsewhere they tend to drive in the middle of the road but much more slowly so you have time to get into the gutter while they pass. Between us - Paul driving, Rachel navigating and Lynda gritting her teeth or sleeping in the back - we managed to find our way around and not get lost too often. Lynda wanted to go an see the pitch lake, about one and a half hour's drive down to the south of the island. "Why do you want to visit what looks like a big, empty car park and, swelter there in the hot sun?" we asked. "Because Sir Walter Raleigh found it" she replied. We humoured her, insisting on getting there as early as possible to avoid the heat and the crowds. 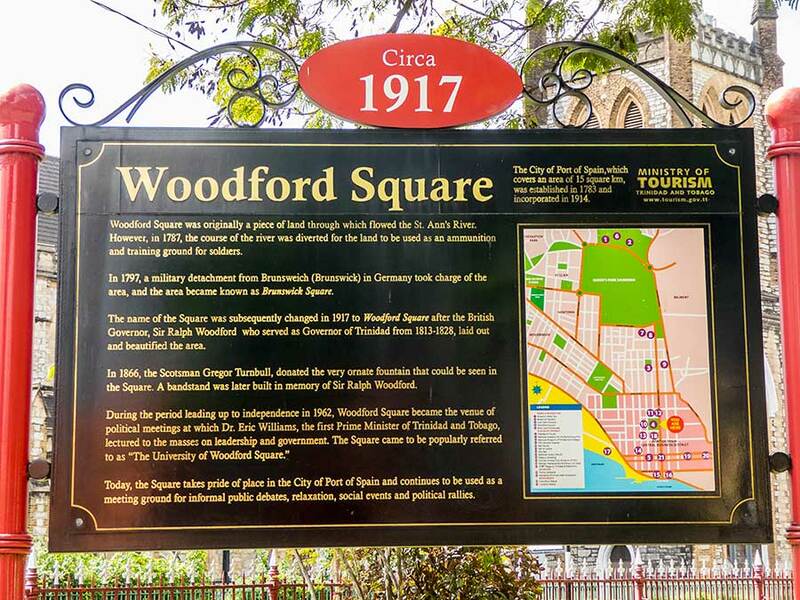 Surprisingly, it is one of Trinidad's main tourist attractions. We took a guided tour - principally to avoid falling in any of the sticky "mother of the lake" - and found it fascinating, though perhaps not the wonder of the world that the locals claim it to be. The north of the island is mostly rainforest and rugged coast so we made various trips to see both. Chaguaramas, the north-western peninsular area where Lynn Rival is sitting in a boatyard, is mostly undeveloped rainforest with a growing number of trails - organised by the local authority - for trekking and nature watching. We walked up to the Edith falls, which are only flowing in the height of the rainy season, but the trail makes a nice short hike. 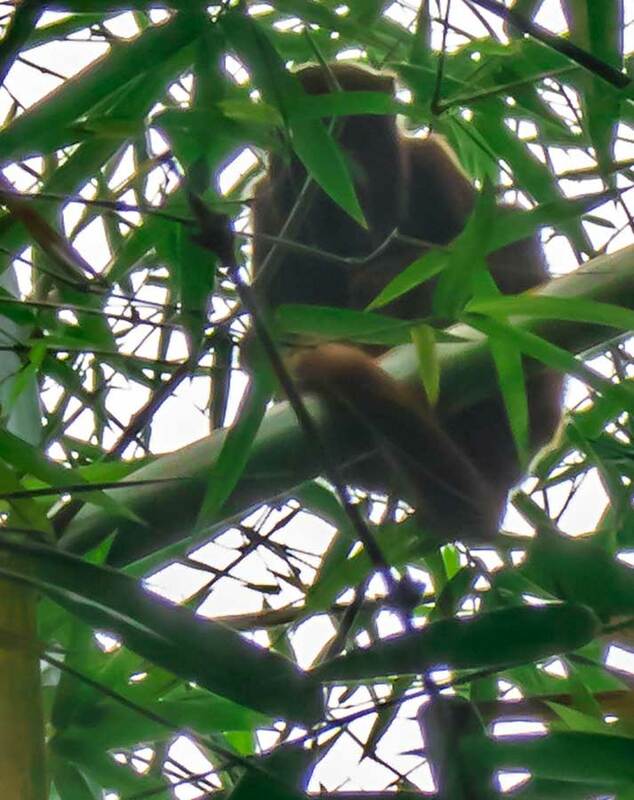 There we saw a red howler monkey for the first time. Another day we drove to the north coast and the popular beach of Maracas. It's undergoing development of its beachside facilities so not very welcoming but we paddled at a nearby beach and then drove on to Las Cuevas - another lovely bay. Here we were fascinated by the warning signs. Many beaches in Trinidad and Tobago have lifeguards and warn about strong currents and undertow. 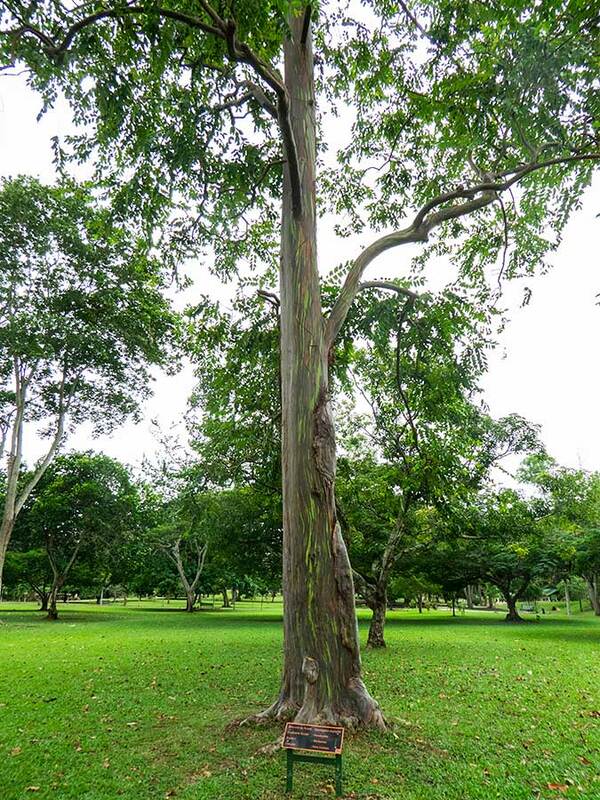 In Tobago it was also common to see warnings about the Manchineal tree, which grows on the shore and can give you blisters if you touch it, or even sit under it in the rain. Needless to say it's a bad idea to eat the fruit. In Las Cuevas we also saw signs warning about Portuguese Man of War and even tsunamis. We hadn't thought about it before but the eastern Caribbean is an earthquake zone so tsunamis are something to watch out for when bathing. For birdwatchers a visit to the Asa Wright Nature Reserve in the centre of the northern mountain range is a must. We went as day visitors and had a short introductory walk in the rainforest. 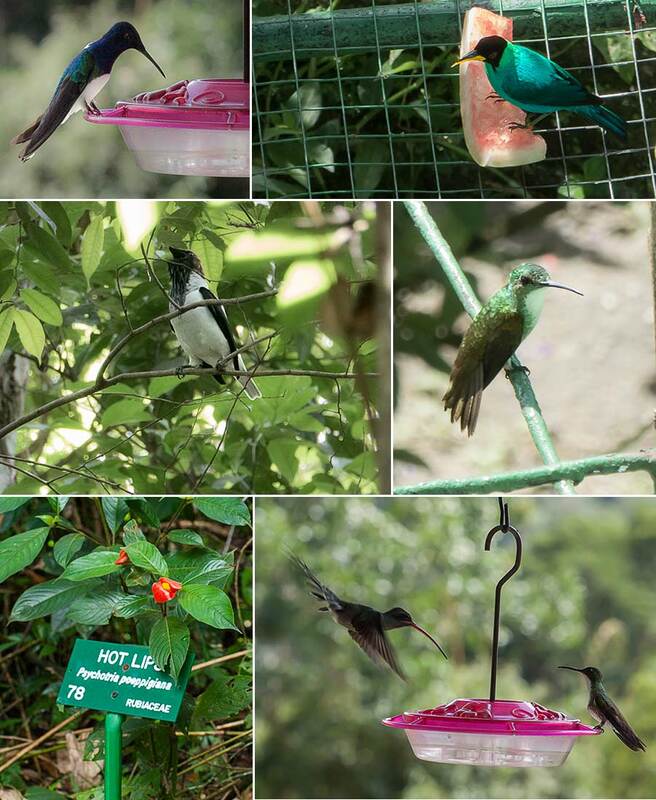 We enjoyed it very much and saw some interesting birds but we missed the special touch of our expert Tobago rainforest guide (Newton George). 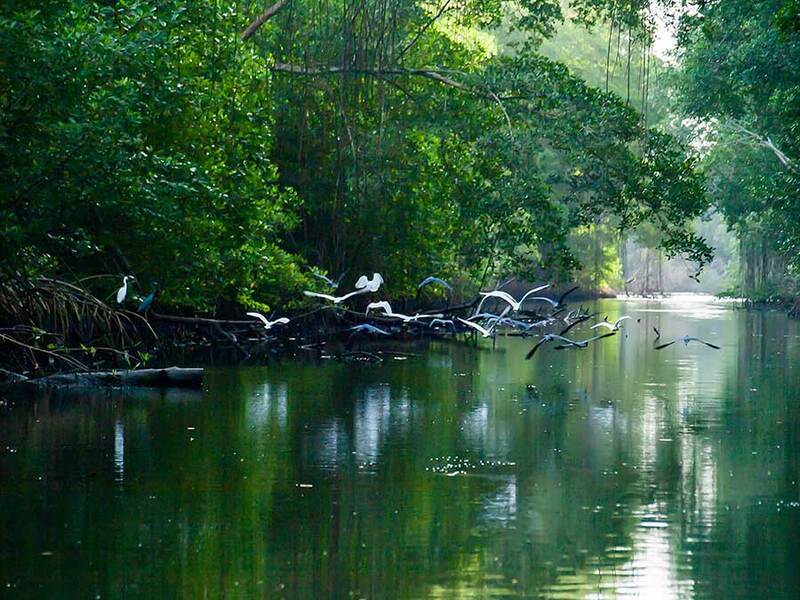 The most spectacular wildlife experience in Trinidad has to be an evening trip to the Caroni Swamp, just south of Port of Spain. 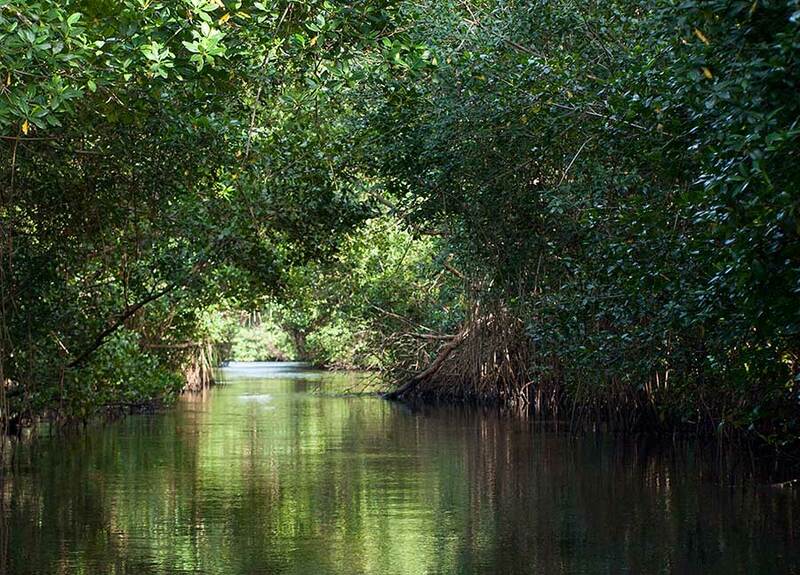 It sounds unlikely but the mangrove swamp is teeming with wildlife and, so long as you are not afraid of what you might encounter in the narrow waterways, very peaceful. Apart from herons and egrets we saw a number of rarer birds, a snake and an anteater (both asleep). 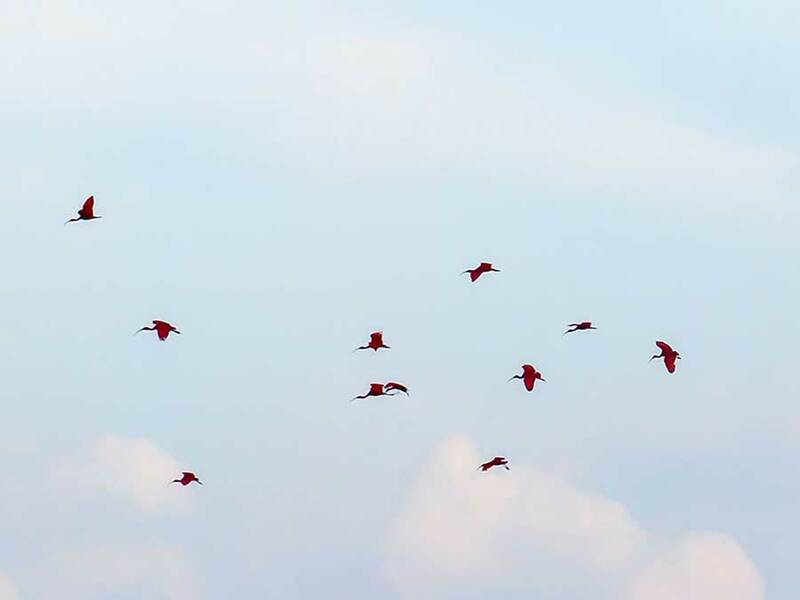 The highlight of the trip comes at dusk when thousands of scarlet ibis (the national bird) fly in to roost for the night on a particular island in the swamp. 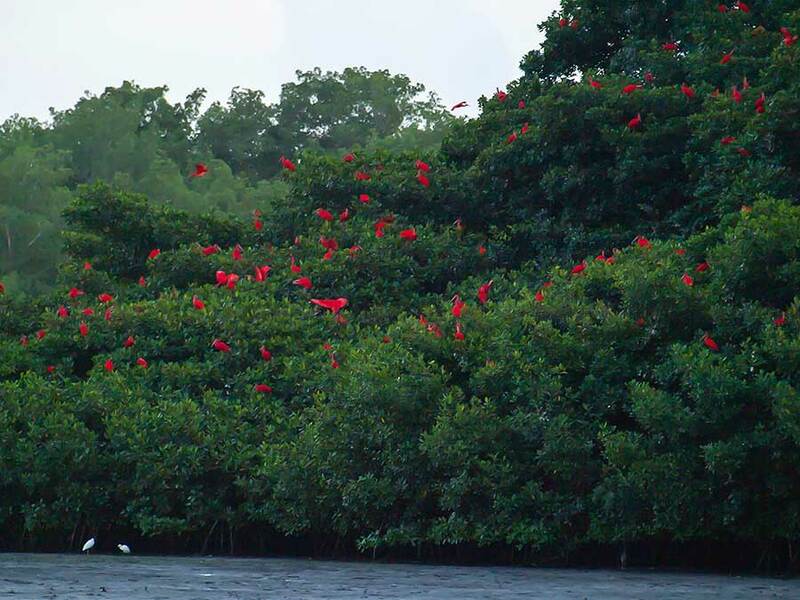 Blue herons and snowy egrets also join them but the sight of these bright red birds flying in and turning the green island into a mass of red specks is amazing. 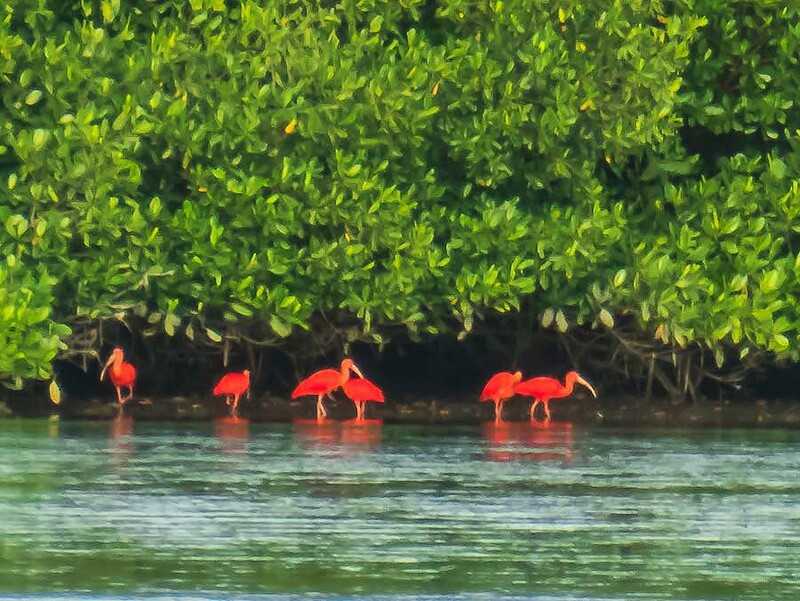 The national bird - scarlet ibis - but there seem to be only a few around . . .
. . . here they come . . .
. . .no more roosting space! The weather on Tobago had often been cloudy, if not wet, and the cooling breeze made the climate pleasant. Here in Trinidad there is less wind and a humid climate that is extremely tiring in the middle of the day so early starts are in order. One day we hired a local boat to do a tour "down d islands" which extend off the Chaguaramas peninsula towards Venezuela. They are popular with weekend boaters and wealthy holiday home owners. We stopped at the furthest island, Chacachacare, a former leper colony, which is mostly deserted apart from a few fishermen living in a makeshift (and illegal) camp. A visit to Trinidad would not be complete without a visit to the Angostura distillery in the eastern suburbs of Port of Spain. It's a big business, not only producing the world-famous bitters but also a wide range of rums. Although the recipe is a well-kept secret - to this day the herbs and spices are imported (via London where they are dried, bagged and labelled in code) without a detailed Customs declaration - we were allowed into the production room. 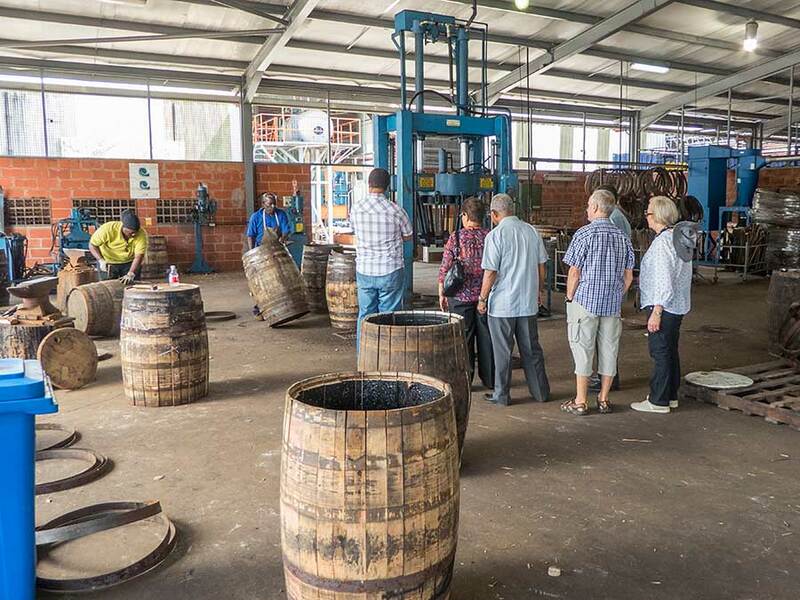 The tour was excellent and we learned all about the different rums and processes as well as getting to taste some of them. We find traditional "rum punch" rather sweet but a combination of Angostura's Single Barrel with LLB (lemon, lime and bitters) is really nice. 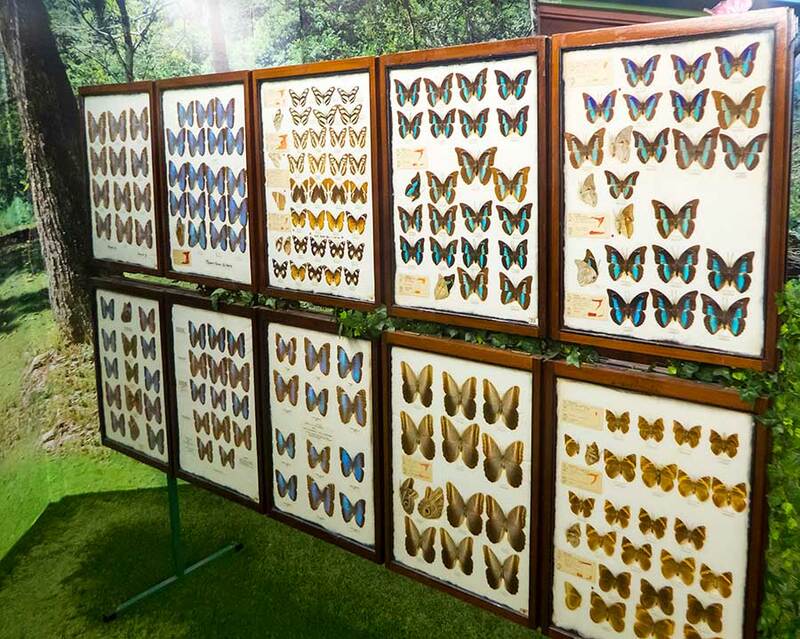 There is also an amazing butterfly collection on the site, which is another fascinating part of the 3 hour tour. 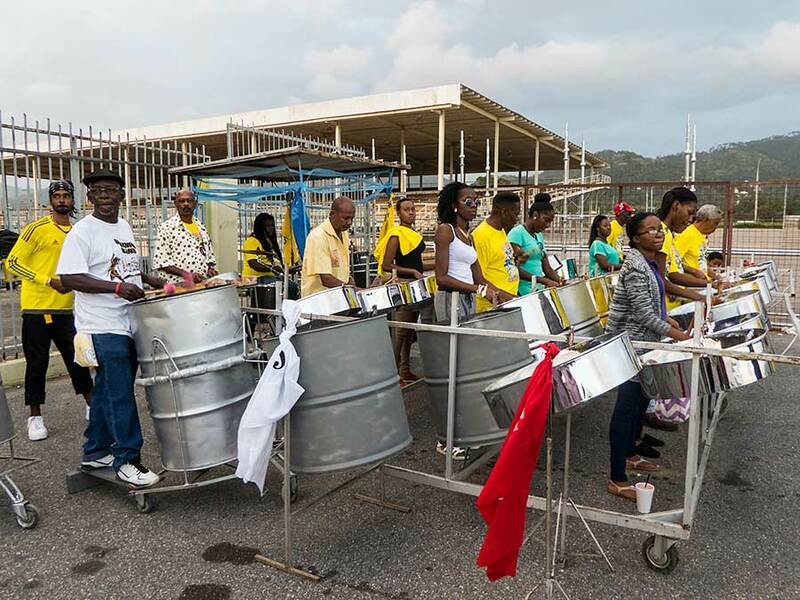 Having exhausted ourselves with our early morning adventures we didn't go out much in the evenings but we made an exception to hear some steel pan music. The northern heats of the annual Panorama competition were being held at Queens Park Savannah so we went along and listened to some of the 29 bands competing that evening. We have no idea what the judges were looking for but some of the bands were definitely more tuneful and energetic than others.